Sometimes it helps a lot to get a record deal with the bigger companies. 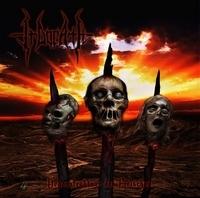 In the case of Irdorath they have released their second album already in 2010 on independent terms, but when they signed with Massacre Records in November 2011 it was decided to make a new release of their second album Dekonstrukteur des Fleisches, and here it is. It has not been the easiest of starts for the Austrians with several line-up changes, and it all ended with Markus Leitner doing both vocals and guitars. All this is settled now, and with this fresh album on the CV they are ready to go on tour here in February 2012. The opening song is Dekonstrukteur des Fleisches, hard and fast black metal where the brightness and melodic atmosphere gives the song an uplifting character. Freitodzwang is a sad topic to sing about, but they put a lot of feelings from the heart into the song that is still black as the cellar. Stummheit gives the listener a very balanced view of the black metal style they practice, a very good song on the plus side of the impressions of this album. The best song comes in form of Spiegelscherben, a fast frenzy guitar sound where you must submit in head banging along with the band. Super. Irdorath are now going on a tour, and have already plans for their next album, that will be interesting to see what they come up with later on.